Your vehicle has a multi-function center console. It includes a storage compartment, an armrest, and a sliding tray. 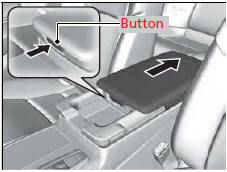 Push the button on either side of the console compartment to open the console compartment. 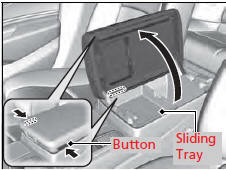 You can put small items in the sliding tray located in the console compartment lid. To use the tray, push the button, then slide the console compartment lid out fully. To close the lid, push the button. It is automatically slid back. The console compartment light comes on when the parking lights are on.